okay on to my latest sketches in my new 9 by 9 sketchbook. practice practice practice. my mantra. cannot get enough of the water soluble pens. and finally the first page of my travel journal … i’ll add writing later. more go-to inspirational sketch masters! cute judy told me about MARINA and she might just be my new favorite. her style is wonderfully appealing to my roughshod aesthetic. THESE pages by joseph are also captivating! my friend suzanne told me about JENNIFER. another style i think is the shiz. after i mentioned jacqueline’s dvd in the last post, someone mentioned her free webinar in the comments. 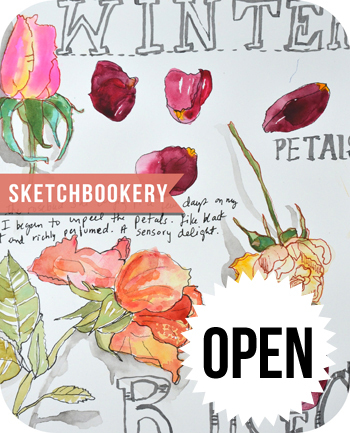 it’s 45 minutes long and super helpful for someone wanting to incorporate lots of sketching in their travel journal. Have a wonderful trip Mary Ann – can’t wait to see all those wonderful sketches when return to us. You’re gonna be missed! Wishing you a wonderful trip, and greatly looking forward to seeing how the sketching and book comes together when you get home – I think it will be FAB!! You’re doing great. Keep up the good work. Love all the sketches. My favorite thing to do when traveling is to find a cozy spot and watercolor paint whatever catches my eye. Have you been to the Flickr group “watercolor journaling” – it is hosted by the fabulous Gay Kraeger and Christina Loop. Their site is: http://www.watercolorjournaling.com They have great classes and a DVD about keeping a watercolor journal. Happy painting! Your map of Umbria rocks! Sketch on Mary Ann!